Mega Sale! Save 21% on the Corning Pyrex 1290-1L Borosilicate Glass Rectangular 1 Liter Roux Culture Bottle with Offset Tooled Neck (Pack of 18) by Corning at In The National Interest. MPN: 1290-1L. Hurry! Limited time offer. Offer valid only while supplies last. This 1 liter Corning PYREX culture bottle is designed so that when laid flat, it will hold approximately one-half of the stated capacity of solution. 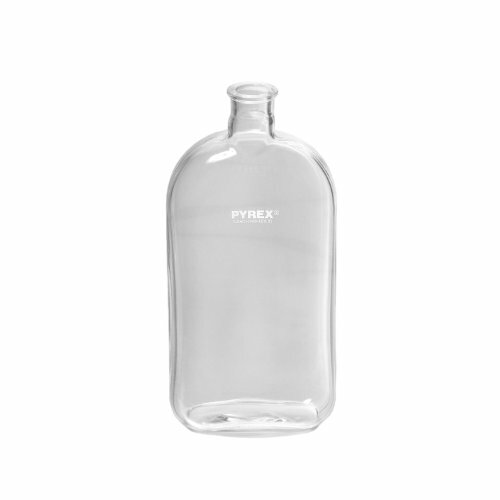 This 1 liter Corning PYREX culture bottle is designed so that when laid flat, it will hold approximately one-half of the stated capacity of solution. The offset neck is tool-finished for increased strength and uniform stopper fit. It will withstand repeated sterilization (wet or dry) and is useful for growing mass cultures. Bottle stacks for easy storage. Nonsterile. No Stopper. Reusable. Material: Borosilicate Glass Code 7740. Capacity: 1000mL. Bottle Style: Roux Culture. Neck Style: Offset. Top Style: Tooled Mouth. Bottle Shape: Rectangular. Bottle Feature: Heavy Wall. Height: 255mm (approximately). Cross Section: 55mm x 120mm (approx). Corning #: 1290-1L.